Attaches to standard electric hand grinders. The Diamabrush By Malish™ Removal Hand Tool (available in 4.5” and 7” diameter sizes) is the ideal solution for removing coatings, adhesives, epoxies and urethanes, thin-sets, paints and other gummy coatings from concrete floors as well as brick, block, stone and metal walls. 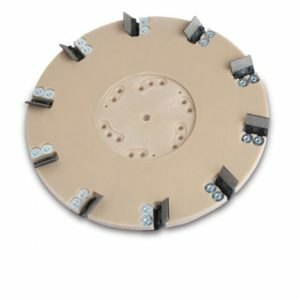 The patented design attaches to standard electric hand grinders and enables users to remove coatings fast and effectively without clogging, resulting in a perfectly profiled surface in a fraction of the time comparable abrasive tools. 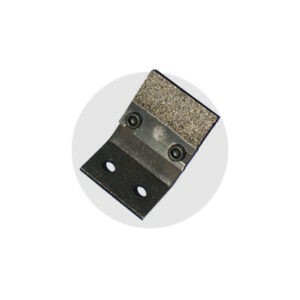 Using the same aggressive diamond abrasive technology as the rest of the Diamabrush By Malish™ line of products, this tool is used with any standard hand grinding to remove gummy coatings, etc. up to 10 times faster than other methods. The unique diamond abrasive technology eliminates the need for chemicals entirely and prevents caramelizing or clogging of the tool. 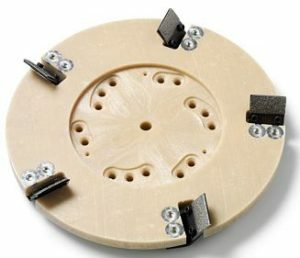 Replacement Blade Kits are available.